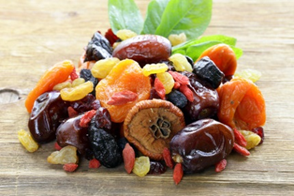 Dried fruits prove that you do not have to sacrifice taste for a snack that is good for you. If you are like most kids, when growing up your parents were always pushing you to eat more fruit. Unfortunately, your preferred way of getting your daily recommended servings came in the form of fruit-flavored candy. Sweet and chewy, dried fruit is a savory alternative. Dried fruit is fresh fruit that has its water content removed. When dehydrated, studies show that some nutrients become more concentrated. In a study in the Journal of the American College of Nutrition revealed that antioxidants in dried cranberries, grapes and plums are twice as potent as those in their fresh state. Dried fruit generally contains a lot of fiber and is a great source of antioxidants, especially polyphenols. Polyphenol antioxidants are associated with health benefits such as improved blood flow, better digestive health and reduced risk of many diseases. Dried fruits are high in natural sugar and are best when eaten in moderation to reap the health benefits. Oh! 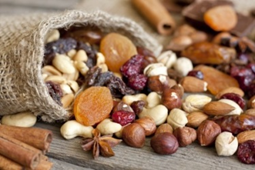 Nuts has a fresh selection of dry fruits, including dried papaya, apricots, dates, figs, apples, pineapple, banana, cranberries, strawberries and more. You will also find an assortment of unique fruits such as persimmons, star fruit, goji berries and pomegranate. 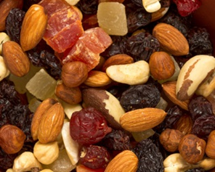 We also carry many savory dried fruit mixes that make the perfect grab-and-go snack for anyone looking for tasty fat-free snacks that are filling and affordable. Choose from tropical fruit and granola, energizer mix, trail deluxe mix, or create your own favorite blend of fruits, nuts and seeds. 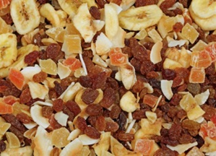 You can order wholesale dried fruit in quantities ranging from a 1-pound bag to a 44-pound case. You can also integrate these sweet treats into delectable dessert recipes or creating tasty gift baskets with a range of different fruits. The dry fruit selections from Oh! Nuts are low-fat or fat-free and low in cholesterol and sodium. Additionally, they are dairy-free, egg-free and certified kosher. Bursting with flavor, rich in health benefits and a highly portable snack, dried fruit wins our award for best all-around treat. While dried fruits are tasty when eaten on their own, mixing them with other fruits, nuts and seeds ups the yum factor for your taste buds. Our wide range of dried fruit is conveniently sold in bulk by the pound, giving you the flexibility to create your preferred medley of flavors and textures. Buy as little or as much as you need - from 1 pound to a 44 pound case. You can also try some of our ready-made dried fruit mixes or snack packs. Whatever you choose, rest assured that in addition to quantity, we deliver on quality. For a sweet and nutty mix, combine cashews, Brazil nuts, dried mango, coconut flakes and banana chips. Another savory mix blends dried apricots, pears, cashews, pistachios, and honey-roasted peanuts. Dried fruits also make delicious chocolate bark that is perfect for gifting during the holidays. Some of our favorite chocolate bark is infused with cranberry and pistachio. 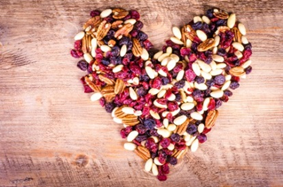 Any combination of fruit and nuts works, try various flavors to find your perfect recipe. For an impressive display of hors d'oeuvres at your next event, include some of our favorite dried fruit and cheese pairings, including brie and apples, berries and plums; Havarti and grapes, pears and raisins; and gruyere and peaches and pineapples. While candy buffets are all the rage, create a tasty alternative with a buffet filled with dried fruits! Set up a rich, earthy display of candy jars in varying shapes and heights filled with fruits, nuts and seeds. It is a terrific idea for outdoor, rustic events such as a barn-themed wedding. Guests can create their unique blend of flavors. Be sure to have treat bags available for guests to take home and enjoy long after the event. Treat your taste buds while nourishing your body with our savory selection of dried fruits. It is no secret that getting your daily recommended servings of fruit plays a role in helping to keep you healthy. Fruits are loaded with a seemingly endless list of good-for-you vitamins and nutrients. While consuming fresh fruit is the main way to nourish your body, many people are opting for the sweeter, and, dare we say, candy-like option of dried fruits. Shop our top dried fruit products and taste for yourself why so many of our customers are snacking, baking and cooking with our best-selling selection. Whether you choose our soft and chewy fruits (mangoes and apricots) or those with crunch (bananas), our dried fruits are low in sodium, cholesterol and fat. In addition, they are dairy-free and have no added sugar or preservatives. Our selection includes a medley of fruits that have been freeze dried or naturally dried at their peak ripeness to preserve the flavors and nutrients. Some of our top products include apricots, papaya, apples, bananas and peaches. Our selection of organic dried fruits is another popular choice for the ultimate healthy snack. Organic apple rings, Turkish apricots and mango slices have been grown without harmful pesticides and preserved sans artificial anything. For extra protein and fiber, try our popular dried fruit mixes made with a blend of fruits, nuts and seeds for the ultimate healthy snack. They offer the perfect energizing afternoon pick-me-up and make a filling snack when traveling, hiking or anytime you are away from home and want something that is as yummy as it is good for you. Our top-selling assortment of dried fruits consists of versatile multi-taskers that are perfect for eating as is, as well as including in many gourmet cooking and baking recipes. Add them to cereal or smoothies, desserts and more! Dried fruits also make great additions to any High Holiday celebration. All of these products are kosher under rabbinical supervision, so you can integrate them into your Jewish celebrations.